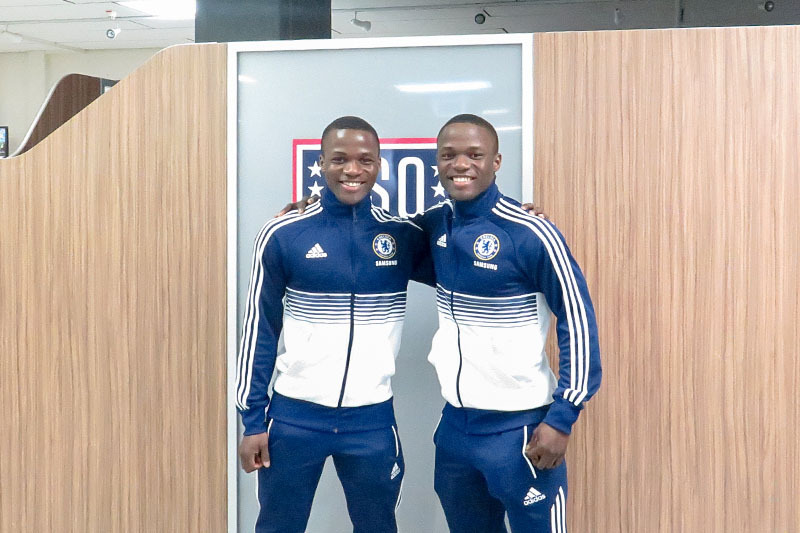 Twin brothers, Taiwo and Kehinde Adelusi, hang out at the USO on Tower Barracks, U.S. Army Garrison Bavaria. Nigerian-born, the Adelusi brothers are examples of a new kind of American Soldier — the kind that brings experience gained from growing up in another culture. They bring unique dynamism and unfaltering resiliency to the U.S. military. GRAFENWOEHR, Germany — Stationed at USAG Bavaria, twin brothers Kehinde and Taiwo Adelusi are examples of a new kind of American Soldier — the kind that brings experience gained from growing up in another culture. These Soldiers bring unique dynamism and unfaltering resiliency to the U.S. military. Their journey began in the summer of 2011, when they left their native land Nigeria, bound for the American Southwest. Taiwo and Kehinde graduated from high school and performed well enough on an English exam to qualify for a tuition waiver that enabled them to attend college in America. “Our parents wanted us to come. They are also proud and glad we are serving in the military,” Kehinde said. The brothers left an older brother and their parents who are still living in their home town of Ikorodu, Nigeria, a city of about one million people. They haven’t seen their parents in over six years, but they are hoping to return to their hometown next year. Nigeria, located in West Africa, is a large country both in terms of land size and population, with more than 130 million people. It is a diverse country with over 250 different ethnic groups, according to the country’s official figures. The discovery of and investment in the oil industry in Nigeria led to the neglect of its agricultural industry. Once the agricultural giant of West Africa, Nigeria now has a faltering economy and struggling transportation system, which makes the pursuit of higher education difficult. The U.S. offered more opportunity than they would have experienced if they stayed in Nigeria, Kenny said. Their father is an engineer, and their mother is a technician at an airport. Because both parents worked outside the home, they were able to send their children to school. In Nigeria, education entails some cost on the part of parents. In addition, many colleges and universities in the U.S. offer financial incentives to foreign students outside the U.S. to enroll in American schools, especially if the students have unique language competency and an interest in the science and Information Technology fields. Kenny and Taiwo speak Yoruba, one of the many languages in Nigeria. Kenny arrived in Lawton, Oklahoma first and lived temporarily with a friend. Taiwo soon followed, and they settled into an apartment that they paid for with their own money. “When we first got to the States, we met some good people who helped us. There was one lady named Mary who gave us clothing and food,” Kenny said. Soon after their arrival, they enrolled at Cameron University in Lawton, Oklahoma. Taiwo majored in Biology, and Kenny studied IT. The brothers graduated from college in May 2015 and joined the Army as specialists shortly thereafter. Kenny and Taiwo were recruited under a special military program called the Military Accessions Vital to the National Interest program, or MAVNI. MAVNI was developed to enable select non-citizens in the U.S. with skills critical to the national interest to obtain citizenship, in exchange for serving in the Army. After the Sept. 11, 2001 terrorist attacks, the military recognized the need to recruit immigrants with certain foreign language skills. Immediately following the attacks, dialects from Africa and the Middle East, as well as recruits skilled in the medical field and IT, were in especially high demand. They received their basic training as mechanics at Fort Campbell, Kentucky. Kehinde described basic training as “awesome,” while Taiwo admitted that while some parts were “difficult,” being in pretty good shape was helpful. Currently, Kenny serves in Vilsesck and Taiwo in Grafenwoehr. The twin brothers enjoy learning and are eager to go back to school. They hope to go work toward their advanced degrees beginning in June. “I would like to try and do something in the medical field,” Taiwo said. Taiwo also expressed interest in being a pharmacist, but hasn’t decided which field of study he will pursue. Kenny has already decided he wants to secure a master’s degree in Cyber Security. When they aren’t working, Kenny and Taiwo can usually be found on the soccer field. They have made friends, both on and off-post, playing the sport. “We play soccer with some German guys, on the village soccer team,” Kehinde said. In addition, both brothers have coached youth soccer both in Oklahoma. They continue to do so in Germany. Kenny aspired to play soccer professionally, but an injury cut his dream short and put him on his current career path. The brothers are also fond of ping pong and regularly practice their skills at the USO. When asked about the unique qualities often associated with being a twin, Kenny acknowledged that he and his brother share a very close bond. “We know each other very well. I can tell easily if something is wrong,” Kenny said. With their drive and determination, the future seems secure for both of these young men. They plan to make their permanent home in the U.S. and have seriously considered pursuing the path to becoming officers. This would require a longer time commitment and higher security clearance. At the present, Kenny and Taiwo will be in Germany until the summer of 2018. Currently, the Department of Defense isn’t accepting applications for the MAVNI program for fiscal year 2017. They are completing a revision of the program and will begin accepting applications when the revision is complete. For information on the MAVNI program, visit their website at ice.gov.